I dashed in again the other day to get a repeat order of the delicious blueberry turnover/bearclaw. The place was HOPPING busy. There were no turnovers because the owner (?) was so busy she did not get a chance to go to the back to assemble them. I took a cinnamon roll instead which, normally, I am not a fan of ordering. As William Horses already pointed out, this one was spectacular. It looked ok in the case but the taste was incredible. Flaky, layered, delicious and still warm. This place is destined for great things if they can manage the numbers of people coming in. Maybe that day was a fluke, being so busy, but the vibe is good and the pastries are spectacular. Love having this addition to the 285 corridor. I have visited the Bean N Bakery several times and it has never disappointed. I have had a few different sandwiches, my favorite-the Italiano Sandwich on a Bagel, and their breakfast sandwich on a croissant. I have also tried the Cinnamon Bun, the Blueberry Turnover, several of their salads, soup and of course coffee. The owner is a pastry chef and bakes everything from scratch! Everything is fresh, and very delicious, not out of a package and microwaved. Plus they are open at 530 a.m. for my early commute down the hill. The owner is just awesome and the staff are very friendly and helpful. I don't understand why this little gem is not more busy. We have 3 Starbucks up here, which is overkill. Every dollar spent at Starbucks is a dollar that leaves the community. I wish some more folks up here would support our small mountain businesses a bit better instead of the large corporate monsters. I would hate to see the Bean N Bakery fail. I am willing to take a couple extra minutes to not go to a Starbucks. Actually, the time spent to visit the Bean N Bakery is about the same time to drive in a Starbucks and wait to be served. No drive thru at the Bean N Bakery, but get out of your car and walk inside, it is worth it. Starbucks is grossly overpriced and just raised their prices again, their coffee is really not that good, their food is bland and taste like high school cafeteria food only more expensive, the pastries are nasty and do not taste fresh, the Ice Coffee contains mostly ice and not enough coffee, I hate waiting at Starbucks. The drive thru was busy one day and I went inside and was the only person at the counter, yet all 6 employees working were too busy to serve me. I asked if only the drive thru was open today and I was told, we will be with you in a couple of minutes. I walked away and never went back, nor will I. The reason Starbucks is one of the most popular coffee venues isn't because their coffee is good, it's because they've been able to brutally outcompete most smaller opponents. I don't care for the burnt coffee, misspelled name on my cup, green straw, mermaid logo or the superior attitudes from Starbucks. I don't need to spend my money on an overpriced brand. I do not want to follow a fad for convenience for my daily coffee intake, I would much rather support a local shop up here. Why you should support our small businesses. Choosing to support an independent business is an act of respect; it’s acknowledges the tremendous risk and challenges inherent to starting your own thing. Relationships created between customers and those that work in an independent business frequently go beyond just what you purchase— it becomes familial. Most independent businesses are run by people - not by boards, not by stockholders or based on algorithms. You get a different kind of care and quality in their product because their work is a reflection of themselves; they focus on the details and being the best they can be. Support each other. Why do you need a reason to do that besides the fact that it’s the right thing to do? Small businesses provide the feeling that a real person is behind it all, someone who cares more about giving you a quality product. Small business owners dedicate a large amount of their personal life, their life savings, time, sweat, tears and time away from family to their commitment and labor to make their businesses both come to life and stay alive, which is very difficult. Yet, many of us frequent chain stores and fail to consider our other small business options, usually because of time or you are stuck in a habit. I am just saying, I hope the Bean N Bakery is successful and folks start visiting on a more frequent basis. I am in no way affiliated with this business nor do I have any other interest in this post except to speak up for a local small business who I would like to see make it up here. I hope you do too. 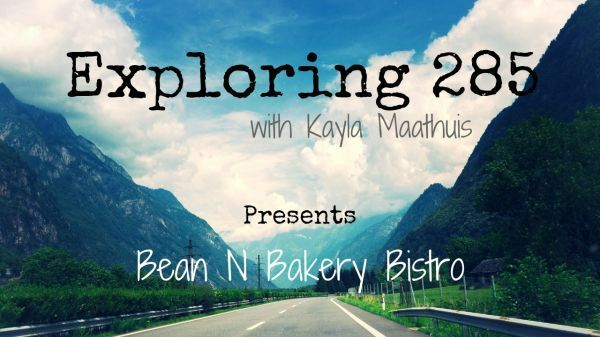 This week on exploring 285 we were at Bean N Bakery Bistro for a great atmosphere! Come on out and explore 285 Corridor! Customizing the Next Chapter of YOUR Life! I've been there a few times and have enjoyed it. The lady that works there is always so nice and remembers us when we come in which is just a good neighborhood feeling too.